With Spain under the gun to urgently address its budget issues, the central government is pressuring the regional governments to do their share. 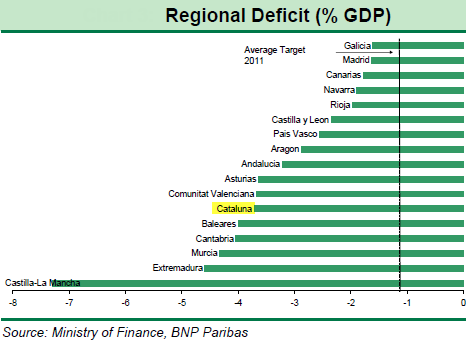 But with the regions running large deficits, tensions between the central government and the regions are escalating. In particular the regions are uneasy about the new law that allows the central government to intervene if the regions "misbehave" fiscally. FT: PP leaders under Mariano Rajoy, prime minister, have rushed through the new law, which allows the central government to intervene in errant regions to ensure compliance, in response to concerns among bond market investors and European officials that spending in Spanish regions and municipalities is out of control. The central government on the other hand is trying to convey the message of urgency to the regions. BNP Paribas: Yesterday, at a conference in Barcelona, the economics minister, when asked by a Catalan business leader if the spending cuts directed at the regions were some sort of payback for the regions’ budgetary slippage last year, said the alternative at this stage would be a budget defined by an external bailout programme, which would be much worse. But the political backlash from such severe budget cuts is inevitable. A detailed article from CNA describes a developing regional government dissatisfaction with the deep budget cuts in Catalonia for example. CNA (All parties in Catalonia, except the PP, are against the Spanish Government’s Budget for 2012): The Deputy Spokesperson for the Left-Wing Catalan Independence Party (ERC), Oriol Amorós, stated that the dialogue bridges with Spain are over. He accused the Spanish Government of having “dynamited” the dialogue with Catalan parties. He stated that the budget presented is “very belligerent” against Catalonia and demanded “a strong stance by the Catalan Government”. At the same time many regions are in a desperate need of a bailout which can only come from the central government. FT: Some indebted regions and hundreds of municipalities have fallen into arrears on payments owed to suppliers and service providers, including pharmaceutical groups and rubbish collectors. Mr Rajoy’s government has launched a scheme through the banks to pay off €35bn of these unpaid debts and so help small businesses. With this backdrop of growing unease, the Spanish government is concerned about the dissatisfaction escalating into violent street protests - possibly much more violent that what Spain had experienced in the past. The leadership seems to think that in order for Spain to achieve the deep cuts it needs, suspending certain freedoms may become necessary - a dangerous path to take. The Telegraph: Jorge Fernandez Diaz, the Spanish interior minister announced in Congress on Wednesday that a reform of the penal code was planned to criminalise those involved in organising street protests that "seriously disturb the public peace". Mr Diaz said "serious disturbances of public order and intent to organise violent demonstrations through means such as social networking" would carry the same penalty as involvement in a criminal organisation under the new reform. But he also said that the measures would extend authorities powers to deal with passive resistance as contempt of court. The measures will make it "an offence to breach authority using mass active or passive resistance against security forces and to include as a crime of assault any threatening or intimidating behaviour," he said in Congress. In addition attempts to disrupt public services such as transportation would also be made a crime. During the recent general strike picketers blockaded bus and train stations in an attempt to bring transportation to a halt. "New measures are needed to combat the spiral of violence practised by 'anti-system' groups using urban guerrilla warfare," the Interior Ministry clarified in a later statement. As markets continue to pressure Spanish government debt, fiscal consolidation becomes a race against time, and austerity driven tensions have the potential to boil over. Spain is in for some rough times.